One of my hobbies is tracking visual learning sites. They may be found under visualization, visual thinking, visualizations, data visualization, mind mapping or mapping complex networks. 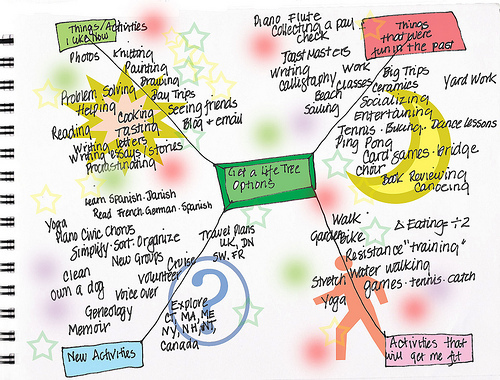 A mind map is an easy way to portray a large idea. An idea I really like for India is was this mind map done by Paul titled “A Vision for India” which addresses an easy solution for India’s population housing need. (1) The Shape of Globalization shows the shape of the automobile industry worldwide. (3) Flowing Data: Strength in Numbers explores how statisticians, designers, computer scientists, and others are using data to help us understand more about ourselves and our surroundings. (4) Visual complexity is my favorite. It has a directory of visual projects arranged by subject. The subjects are art, biology, business networks, computer systems, food webs, internet, knowledge networks, multi-domain representation, music, others, pattern recognition, political networks, social networks,transportation networks, and World Wide Web.